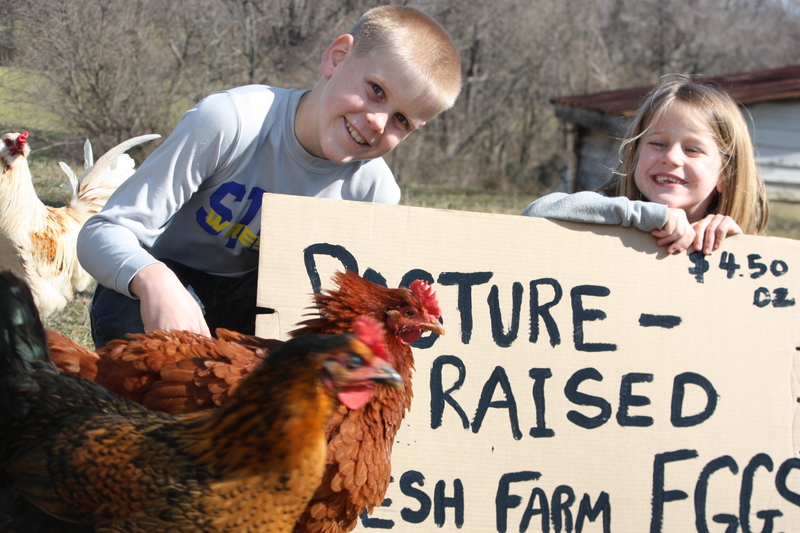 Armed with a flashlight, rain-boots and a wooden bowl, Colvin and her eleven-year-old brother never tire of hunting for eggs, fine or foul weather. Lucky for us, they are relentless and thorough in this daily labor of love. The delight of a full bowl of warm, colorful eggs never loses its wonder for them. $4.50/dozen also lends itself to some wonder, no? But, this is the DC area people! Big city prices don’t deter the steady stream of Saturday afternoon buyers who visit their makeshift egg stand at the end of the dirt driveway. The Hall chickens are unintentionally pasture-raised. This means that they spend all their oh-so-busy chicken days foraging the farm, only to enter the coop at night. It also means that the instant you open their door at sunrise you are trampled in a squawking stampede. I’ve noticed our chickens happen to be particularly dramatic. Upon release in the morning, they act as if they have just spent the night in Guantanamo Bay being waterboarded. Heaven forbid we forget to turn on the warming light at night when it dips below freezing. Oh, such theatrics and beady chicken eye-rolling you have never seen before. Once outside in the chicken yard, all twenty-one fowl fly over the wall into chicken heaven to spend their day feasting on bugs, grass, seeds and whatever else strikes their culinary fancy. 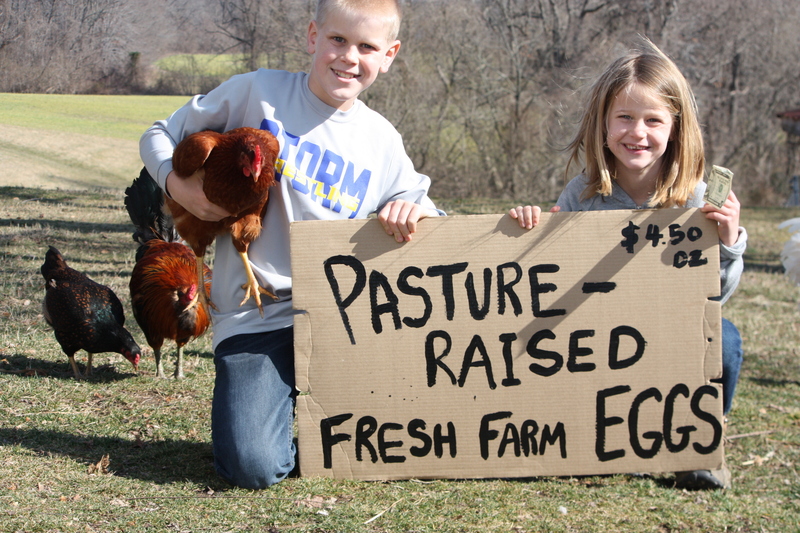 I’ve learned that this is what makes pasture raised eggs different from organic, or even free-range eggs. When the bulk of the chicken’s diet is grasses, seeds and insects, rather than feed, they will happily lay good-for-you eggs. Who knew? Late at night, our chickens will reluctantly, with bribes of vege scraps and treats, return to their chicken house for protection from the resident foxes and weasels. Well before first light, they will proceed to whine, screech, and threaten an actors-guild strike if they have to be cooped up past dawn. They all could have earned an Oscar last night. The result is that our chickens peck and poop over every square inch of the farm for about sixteen hours a day. Wheat fields, barns, meadows, yards, the smokehouse, my garden…it is all available for their eating and egg-laying pleasure, like it or not. Because of this freedom, beautiful eggs (some of them blue and green) may be found in safe, cozy and out-of-the-way spots. Little treasures, still warm in the hand, lie waiting to be found. And so the young egg farmers pull on their boots several times a day and yell “I’m going to check for eggs!” as they stomp out the door on a mission. Peace to you today as you notice the small, wonderful things that make you smile in their goodness. I’d like to hear about them, if you have a moment. I love this story! The hunt and gather mentality is so fun and energizing for all ages. I can actually see the chicken during jail break! How are you going to create the farmer lifestyle in Lakeway? What a cleaver idea! Previous post If you (or your kids) don’t like church. Next post Alone? Or Just Lonely?